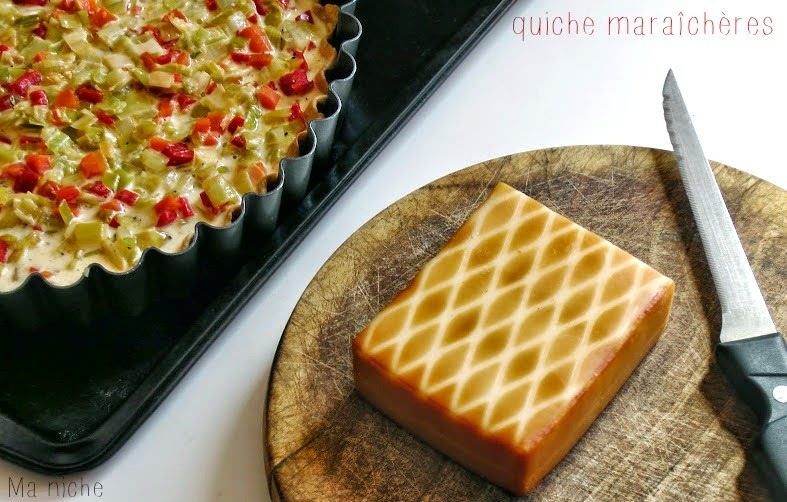 Quiche Maraîchères (pronounced as maʀeʃe) was this week's assignment for the French Fridays with Dorie. No. The recipe, though a little unusual, wasn't complicated at all. All we had to do was to toss chopped celery stalks, leeks, carrots and red bell pepper in melted butter. Cook the veggies for about 10 minutes, then spoon the cooked vegetables into a 9 inch partially baked tart shell. Next whisk cream with an egg and an egg yolk, pour the custard over the veggies and bake the quiche for about 20 minutes at 400°F. Finally sprinkle grated Gruyère or cheddar over the semi-baked quiche and bake it for another 5 to 10 minutes, or until the cheese is golden and the filling is uniformly puffed, browned and set. My quiche would probably have come out of the oven all pretty and dolled up had I not been over enthusiastic about letting the filling puff and brown uniformly. In trying to do so, I let the quiche bake for an extra 10-12 minutes which made it as brown as it looks below :( Anyway though thoroughly browned and somewhat over baked, the quiche tasted wonderful. I used grated smoked Gruyère cheese on top and both husband and I thought that that cheese made it even more flavorful. We simply could not stop admiring the quiche. We loved it warm, we loved it cold, we loved it every time we cut a wedge out. It was simply fantastic ! 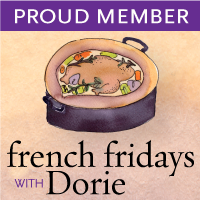 Visit French Fridays with Dorie to know what the other members thought about this quiche. You can find the quiche recipe here and the recipe for the tart shell here. For more such delicious recipes order your copies of Around my French Table and join the Doristas in this tasty adventure. Perhaps...but nutty brown cheese has its own good associations. I bet this was quite fantastic. Very pretty and good job! This was a winner! Did you also use a smoky Gruyere? 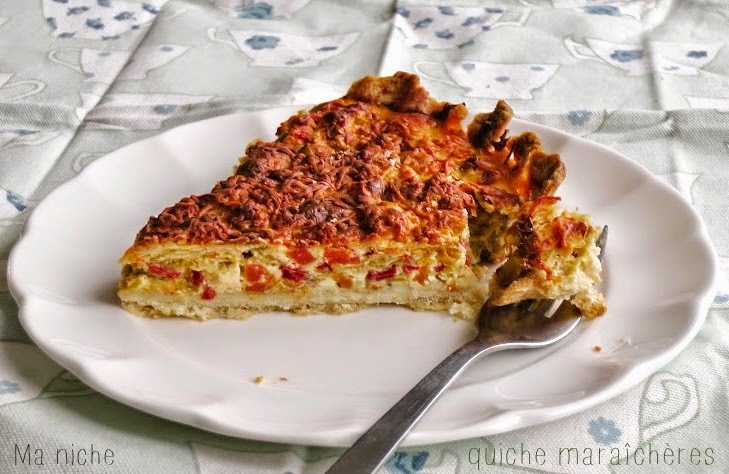 Tanusree, so nice that you are so very enthusiastic about this quiche recipe - a nice treat wasn´t it?! Your quiche looks gorgeous! Kudos! Uniformly to one person is a different uniformly to another. As you saw on my quiche, my "covering of grated cheese" was entierely different from others. I sorta went for the "smothered" effect. It was still good. I know we'll all make this again - it was delicious, wasn't it? I'm so glad this was a hit at your house, too!!! A resounding success for all the Doristas!! 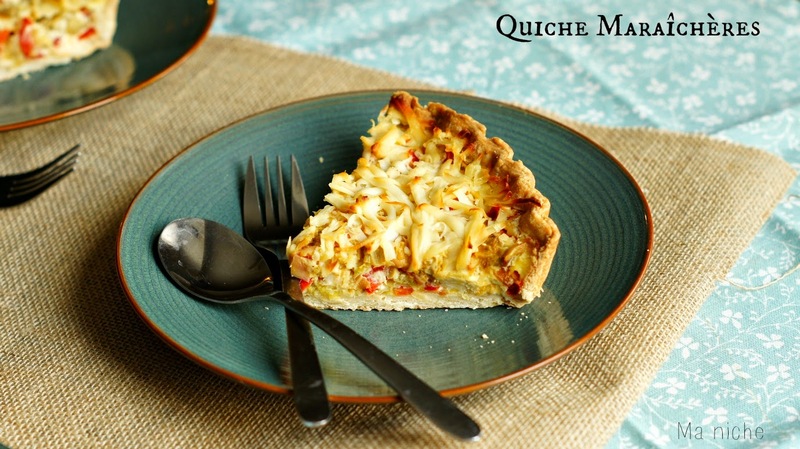 Your quiche looks lovely…glad it was a hit with your family! We loved it too! In my book baked cheese tastes great whether it is baked or over baked It was great recipe I am glad you liked it as well! Looks just fine to me. Lovely and brown cheese. This was a great quiches. Lunch for several days. Mine, all mine! It looks beautiful. We really loved this one, too!